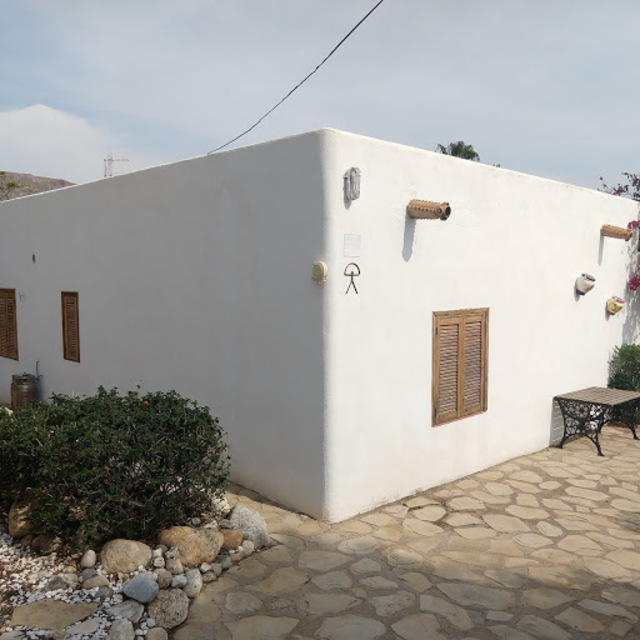 This detached villa for sale in Cortijo Grande near Turre, Almeria, Andalusia is on an elevated plot giving extensive views across the whole valley. Situated at the foothills of the Sierra Cabrera mountains there are impressive views on all sides. The villa is spread over one level, making an ideal spot for a family holidaying with grandparents or small children. The extensive terrace at the front of the villa offers spectacular views across the golf course and extends around the house to the back where the swimming pool is located. An ideal place to soak up the sunshine whilst enjoying the deceptively large pool. A separate covered area is nicely situated to the side of the pool, giving a delightful spot to enjoy alfresco dining out of the intense summer heat. There is a small roof terrace that can be enjoyed with some tranquility again with magnificent views from here. The villa is accessed through the kitchen which is modern, fully fitted and well equipped and leads to the dining room which in turn enters into the large lounge. With windows on every side and access to the pool terrace the lounge is bright, spacious and airy. The decor is simple and inviting and the house is well equipped for both summer and winter living with air conditioning in the bedrooms and an open fire in the lounge, satellite TV and Wifi complete the list of modern day essentials. The master bedroom is en suite, has plenty of built in storage and has its own access to the front terrace. The two twin bedrooms are located to the other side of the villa. Both with access to the front terrace and a large family bathroom. A separate entrance from here also gives access to the back terrace and swimming pool. All on the level, private and well equipped, this charming villa makes for an ideal hide away in the sun. From Cortijo Grande you are approx 20 mins drive to the coastal area of Mojácar. A municipality situated in the province of Almería (Andalusia) in Southern Spain, bordering the Mediterranean sea. It is 90 km from Almeria, the capital of the province. Mojacar has an elevated mountain village displaying the traditional white colour houses from its earlier days and is a historic landmark of our area. Mojacar has 17km of beautiful open beaches and rugged coastline.